Why are people so infatuated with Marrakech? This city has consistently been named one of the top travel destinations in the world and everyone who visits leaves recommending it to all their friends. It could be the busy medieval marketplaces, the lush gardens, the amazing food, the incredible history and architecture or simply the culture of Morocco. Marrakech is a beautiful city that is full of life. But if you want to take a break and enjoy some greenery in the middle of the city, you should stop in one of Marrakech’s relaxing gardens. One of the more famous gardens of Marrakech is the Jardin Majorelle. 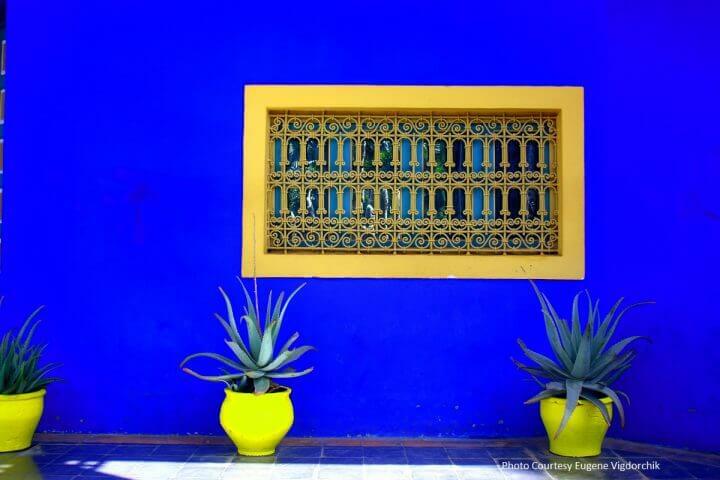 Known for its bright colors and perfectly designed grounds, this garden was gift from French artist Jacques Majorelle. Walk through and feast your eyes on the bold blue paint, cheerful yellow accents, and lush green paint. Imagine walking around in a piece of art…the feeling is truly magical. While you are there, be sure to check out the Berber art museum! Others prefer the Menara Gardens to the Majorelle, because these gardens are less tailored and seem more natural. This large garden is an olive grove, with a pavilion and an artificial lake. You might also have an amazing view of the Atlas Mountains, especially if you are there in the right season. A bonus to this garden is that there is no entrance fee, unlike the Jardin Majorelle. The Koutoubia Mosque is a landmark in Marrakech, and you might find it helpful to look for if you get lost. It is the tallest mosque in Marrakech, and towers over the constant activity underneath it, faithfully reminding the people of the city to attend to their religious duties. The Koutoubia mosque was built in the 12th century, and you’ll find it to be an incredible display of Moroccan architecture. 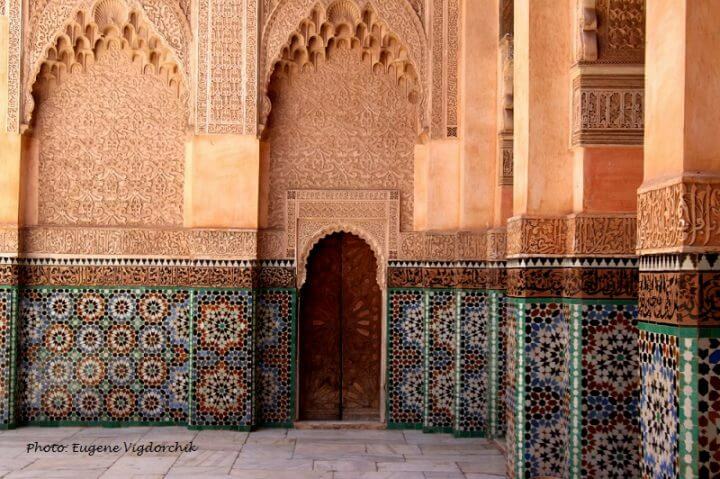 Imagine a burial place designed exclusively for Moroccan royalty and you have the Saadian tombs. At least dating back to the 15th or 16th century, members of the Saadian dynasty and some of the sultan’s trusted advisors are buried in these impressively decorated tombs. You’ll see two mausoleums there: one built for Sultan Al-Mansour’s own tomb with the famous 12 Pillars, and the second housing the sultan’s mother’s tomb and the founder of the dynasty. When the dynasty fell, the next ruler ordered this burial place to be sealed up. It was then forgotten about until rediscovered by aerial pictures in 1917. They have since then been restored and remain an important historical site in Marrakech. 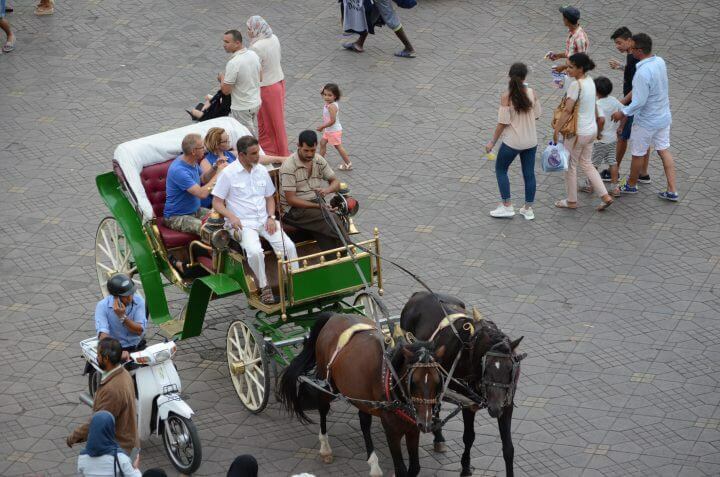 You might think that taking a horse and carriage ride around Marrakech is a very touristy thing to do. And yes, it is touristy, but it is very fun and a great way to see the city without having to walk. If you are traveling with kids, this is a must. The horse and carriages are easy to find; there will be a line by a main square and you’ll have to bargain with your driver to try to get the best price possible. Sit back and enjoy the ride! 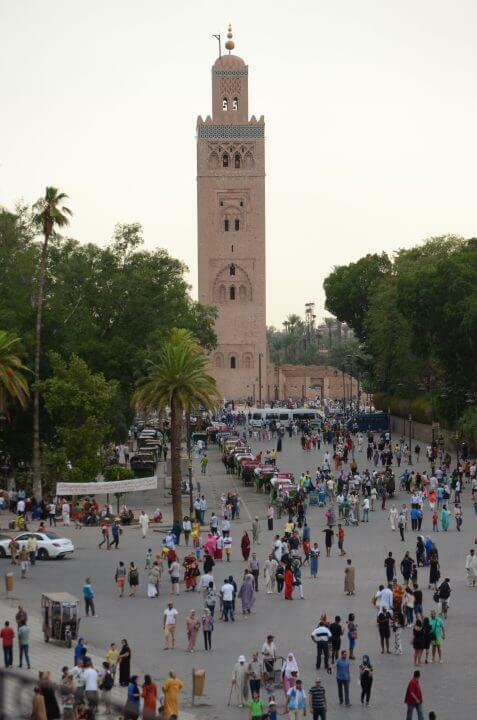 You cannot go to Marrakech without experiencing Jma El-Fna, the famous square of Marrakech. This is the kind of place that makes you feel like you are in another world. You’ll want to go at night, when the square is packed with entertainers, delicious smells and music. Stop at a barbecue for dinner, watch the snake charmer, browse the stalls piled with dried fruit, or watch the drama of the storytellers. Activity is all around you and you will feel yourself being caught up in the excitement. You’ll probably find yourself coming back to this square more than once to repeat this exhilarating experience. Have you ever wondered what a 19th century Arab vizier’s palace would look like? Check out the Bahia Palace, built for Grand Vizier Si Moussa and later used by his son, Bou Ahmed. It was raided by his servants when Ahmed died, but the palace has since been restored. You’ll walk in and see breathtaking architecture from painted ceilings to elaborate tiled walls and floors. The gardens are also beautiful. While in Marrakech, make sure to do a little shopping for souvenirs! A wonderful place to do this is in the medina of Marrakech. The medina is a walled in old city filled with different stalls and shops. It’s a great place to wander through, stopping whenever something catches your eye (which will happen quite often). 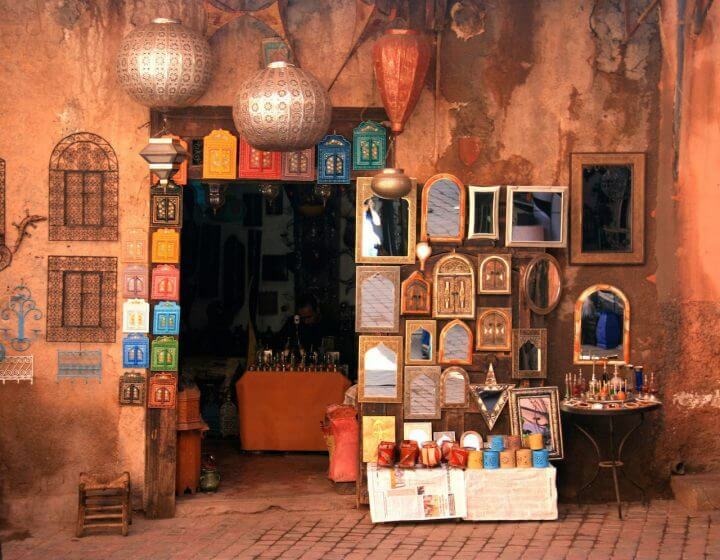 You’ll see everything from sparkling lanterns to handmade carpets to colorful Moroccan shoes. It might be a maze, but the longer you explore the less touristy the shops become. Don’t be afraid to bargain! If you are interested in learning more about Islam and religious history, this medersa (or religious school) is definitely a stop for you. When you walk in to the large open courtyard, the first thing you will be struck by is the almost honeycomb look of the detailed tan upper walls and doors. A bright colorful mosaic pattern repeats all around you at the base of the walls. Every part of the architecture is touched by religious significance—down to the number of points on the stars in the tilework. Arabic inscriptions also decorate the walls. This school was one of the largest religious schools in North Africa and was founded in the 14th century. You will be able to climb the stairs and see the tiny rooms that students used to sleep in. Look down at the beautiful courtyard when you are up there—what an impressive sight! The hammam, or public baths of Morocco, might be an unusual experience if you aren’t used to them. They are a great stop if you want to try something different, though! There are separate times for men and women, so you will have to make sure that you are planning to go at the right hours. The baths are full of steam and have fountains of water. You can purchase some handmade Moroccan soap and shampoo and if you are feeling very cultural, you can ask an attendant to help scrub you down with an glove that almost feels like sandpaper. You’ll walk out cleaner than you have ever been in your life. Not so sold on the full public bath experience but still want to relax from your wandering? There are many private hammams or spas that you can choose from in Marrakech. If you are staying in a riad, there might be a spa there that you can try. If not, some others include Les Bains de Marrakech, Hammam de la Rose or Heritage Spa. The Jma El-Fna isn’t only worth seeing at night. There are vendors and people there during the day as well, and it can be a very interesting place to people watch. Take a break from all of your Marrakech exploring and choose a café near the square to unwind at. 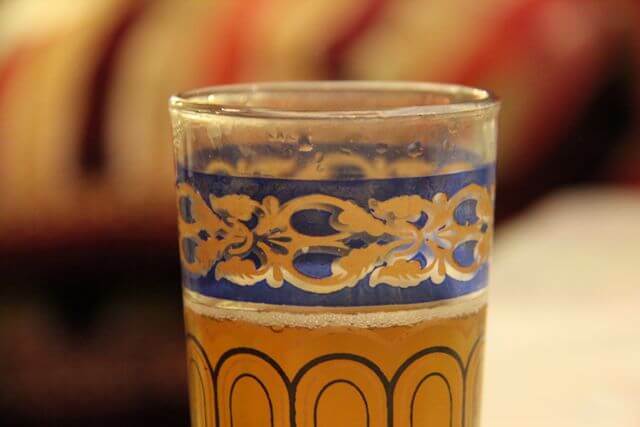 Make sure you order the mint tea at least one time while you are there…this sweet tea is one of Morocco’s specialties. Of course, the best way to truly experience a Moroccan riad is to stay in one while you are in Marrakech. A riad is a traditional guesthouse that usually has a garden inside. There are many beautiful riads to choose from, and you will certainly love being pampered while you are there. However, even if riads are not in your accommodations budget, you still need to see the inside of a riad. You’ll be amazed at the colorful tilework and detailed carvings. Walk in for some tea and a tour. If you are tired of city sightseeing (which might be next to impossible since there are so many amazing things to see) then why not see Marrakech from a different perspective? If you are looking for romantic activities in Marrakech, this should certainly go on your to-do list. Ciel D’Afrique is a hot air balloon company in Marrakech that has high ratings from their clients. You’ll arrive early in the morning and be greeted with mint tea before your once in a lifetime experience. Be sure to take pictures! 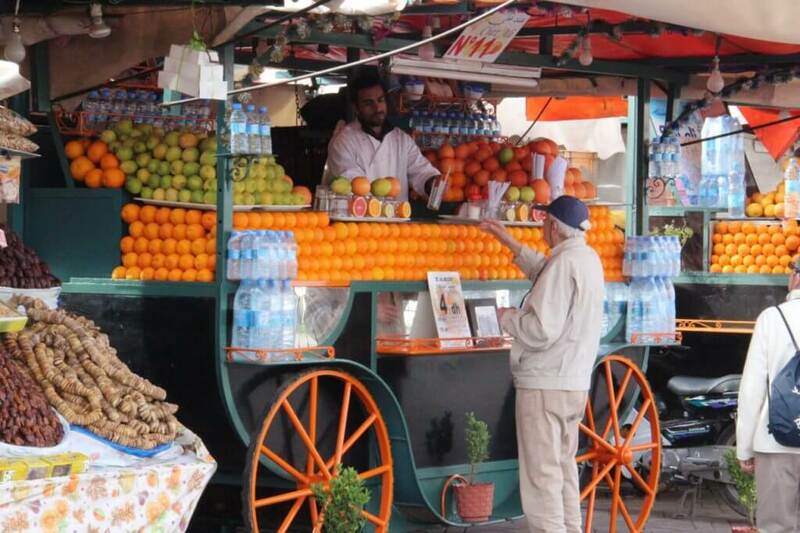 How could you come to Marrakech and not try the fresh squeezed orange juice? Cool, sweet and a little tangy, this drink is perfect at every time of day. It’s both cheap and delicious and you might find yourself a little addicted once you taste it. This photography museum holds a vintage Morocco photo collection from about 1870-1950. It’s a small museum, but the pictures are very interesting for you to catch a glimpse of Moroccan history. It’s rooftop café is also a highlight with a great view of the city and delicious food! This one depends on how much time you have in Marrakech. 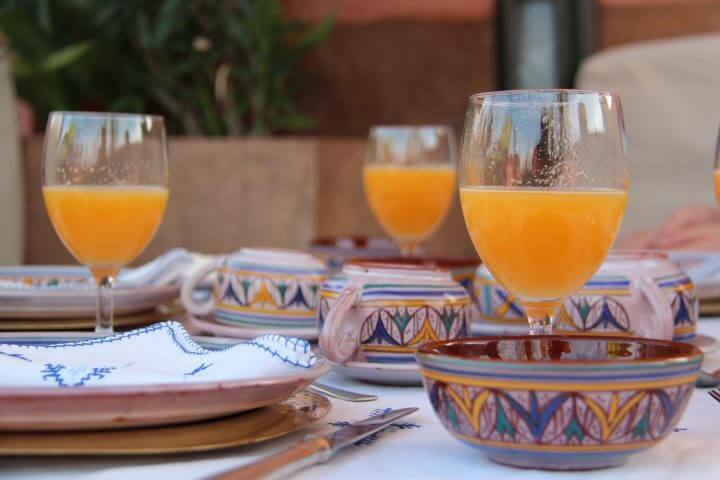 If you are only in Marrakech for a short time, then you should use your time in the city and see all the main attractions and get a feel for the city. However, if you are going to be in Marrakech for a couple of days, you can take a break from the busy city life and visit the beautiful Atlas Mountains for a day trip. There are lots of other interesting places a day’s trip away from Marrakech such as the Ouzoud Waterfalls, Ait Benhaddou and more. Whichever of these you end up choosing to do, we hope your time in Marrakech is fantastic! Contact us if you need any help planning a personalized tour from Morocco experts.